The Scroll represents the Scriptures from the prophets and the highest ranking prophet in the past would have to be Elias. Also these three people were they only one’s up until that time who fasted for 40 days. 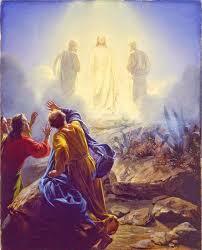 One of the reasons for the transfiguration of Our Lord was to demonstrate the relationship between our body and our ghost, (soul). The reason being is for what transpires during the general judgment & Testimonial trial. “In a moment, in the twinkling of an eye,..” I Corin. 15:52.” Often to illustrate this at some of my lectures, I would go over to a light switch, then point to the light bulb in the off position, explaining that with the light bulb turned off think of it as our physical body. When the Angels turn the switch on, we go immediately to your Ghost, just as Jesus did. Evil angels. This all takes place in the week of Pentecost ending on the eve of Trinity Sunday. Remember, however we are talking about Middle East time. ← New and Used Manufactured Homes Most in the Los Angeles County area.